Hello! Check out my podcast Make and Decorate Podcast .Episode 3 is out now. I take you through my sewing machine journey from being a Naive to savvy purchaser. Also, please subscribe, rate and review my podcast so that it will be easier for other people to find on iTunes etc. Another goal met for this year...start my YouTube Channel!! Yay!!! Click on the video above to view my channel and please, please hit "Subscribe" so I can grow the channel. I plan to capture a lot of my sewing, quilting and makes on video so you can learn and interact with me as we all sew our way through our creative maker lives. 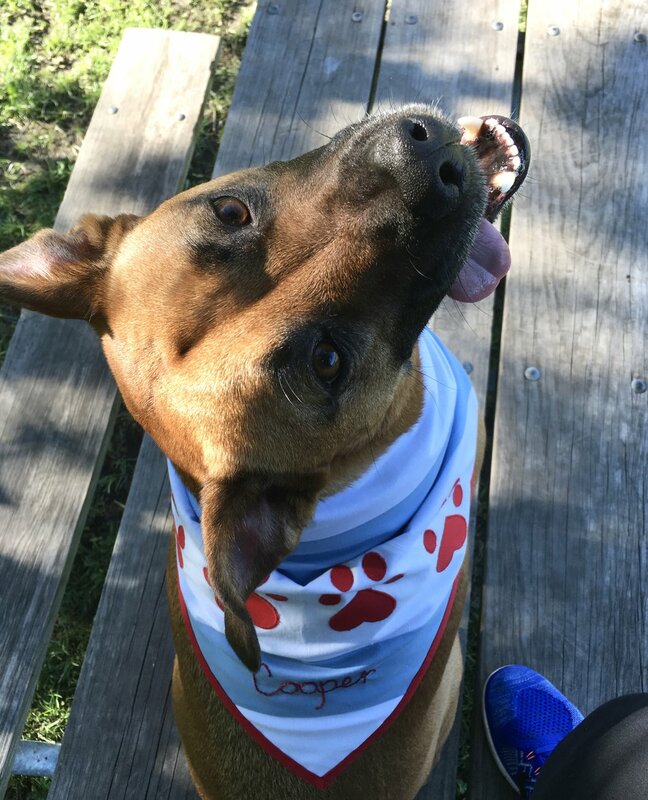 Let me know if you would like to see some "live" videos on quilt projects I am currently working on, or have questions on sewing techniques, machines, tools etc. Also, check out my Make and Decorate Podcast. It's been a few years since I have made kiddos size clothing. A few months ago my sister texted me the photo to the right. This is a dress I made for my niece's big sister when she was a toddler about 8 years ago! I have to admit, I teared up just a bit...this is why I sew. The clothing, quilts and any handmade creation we make, is not only going to hold up like an heirloom, but it is also going to be cherished by the ones you love. 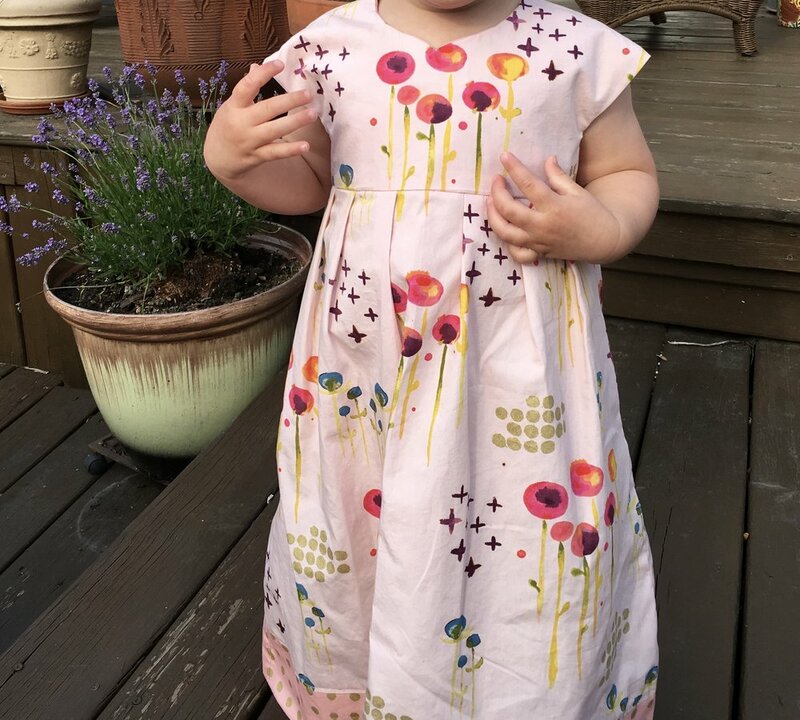 It fills my heart to see my sister pass this dress down to another kiddo to wear and enjoy. Then I thought, hey, I should make a couple more dresses for two of my nieces that are currently 2 years old. It's such a fun age, and clothes look so cute on them. I heard about the The Geranium Dress pattern by Made by Rae , on a couple of podcasts, and I really wanted to try this pattern out. I purchased the main pattern in 0 - 5T size and the expansion pack with more add-on options. I love this pattern because it is so versatile and you can make a tunic, dress, different styles of sleeves, pleated or gathered skirt. It's really a pattern you can make over and over without feeling redundant. The fabric is a very beautiful soft organic cotton. The fabric is from the Haiku 2 collection by Monaluna . The pink is called Poem Petal in Poplin, and the green is Poem Sage in Poplin. The gold dots in the fabric are a soft metallic - soooo pretty. I absolutely love this fabric design. The pink dress was my first version of this dress. It took a couple days for me to complete the pink dress because I had to print, cut and tape the pattern pieces together first. I also reviewed all the options, finally settling on making View B with the contrast hem band. It turned out a cute maxi length, and leaves room for growth. I wanted to make the second dress in a different style, so I opted for the top in A, and I kept the pleated skirt so the large scale pattern didn't get distorted. If I had made the gathered skirt style, the pretty pattern would get lost in all of the fullness of the gathers. This is something to consider when making this dress. This dress came together very quickly - in one afternoon. I already had the pattern pieces ready and I was freshly familiar with the process. Before pre-washing yardage: If you have a serger, do a 3 thread overlock stitch on the non-selvage sides. If you do not have a serger, do a zig zag stitch. This will eliminate threads raveling and eating into the yardage. 2. Fussy Cutting: The front bodice piece is supposed to be cut "on the fold". If you want a specific part of the fabric pattern to be centered on this piece, you will need to copy and tape the mirror part of that pattern piece to make a complete bodice pattern piece. Then either trace or cut around the full bodice pattern piece on the part of the fabric you want. 3. Press up hem before sewing front to back pieces. It is much, much easier to press the hem up when its in a flat piece of fabric, than at the end when its in the round. This saves so much time and frustration. 4. Hand stitch the lining to the bodice. The instructions give both machine sewing and hand sewing options to attache the lining to the bodice. I did the machine sewn lining in the pink dress (sorry, I forgot to photo this part on the pink dress), and hand stitched the lining in the green dress. They both look nice, but the green dress looks more "couture" and professional. It really does not take very long to hand stitch this lining, and I think it's worth the extra effort. 5. Button Holes: The directions indicate the placement of the button holes to start at same center point of button placement. I did this on the pink dress, and I thought there was too much fabric to the left of the button hole. I placed the button holes 1/8" left of the center mark, and it was much better - I could've even done a 1/4" in, but didn't want it to be too close to the edge of the fabric. Of course, practice the button hole on scrap fabric before the real deal. I also put the button through the button hole to make sure it fits well, then I exhale and go for it on the dress. I do love the button hole foot and feature on my Bernina 820, which is the only part of the dress that I used my Bernina for. 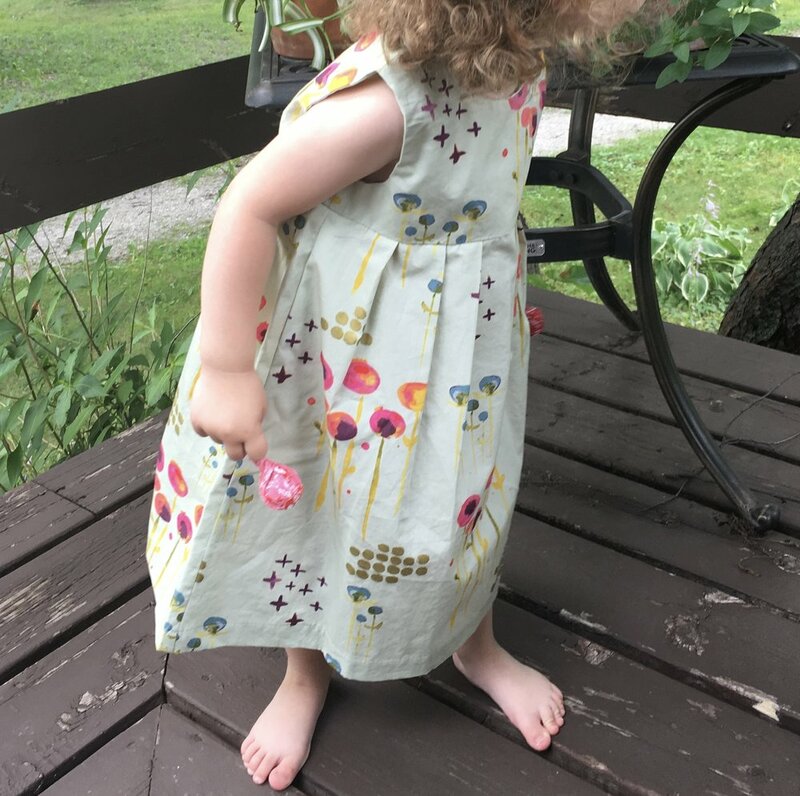 I used my straight stitch Juki TL2010Q for the construction of the rest of the dress, and also my Babylock Ovation to overlock and trim the side seam allowances. Overall, this dress was really fun to make. The dresses really fit well without alternations to the pattern - Yay!! You could definitely up the time and difficulty factor by adding details like ruffles, sleeves, zipper, hem band etc., but you also get endless options for totally different dresses and tunics from one pattern, and that is pretty awesome! Let me know if you have made this dress before and if you like the pattern, and how you customized it. I have been a huge fan of Sara Lawson of Sew Sweetness for quite a while now. Sara is a pattern designer of one of my favorite things…bags! 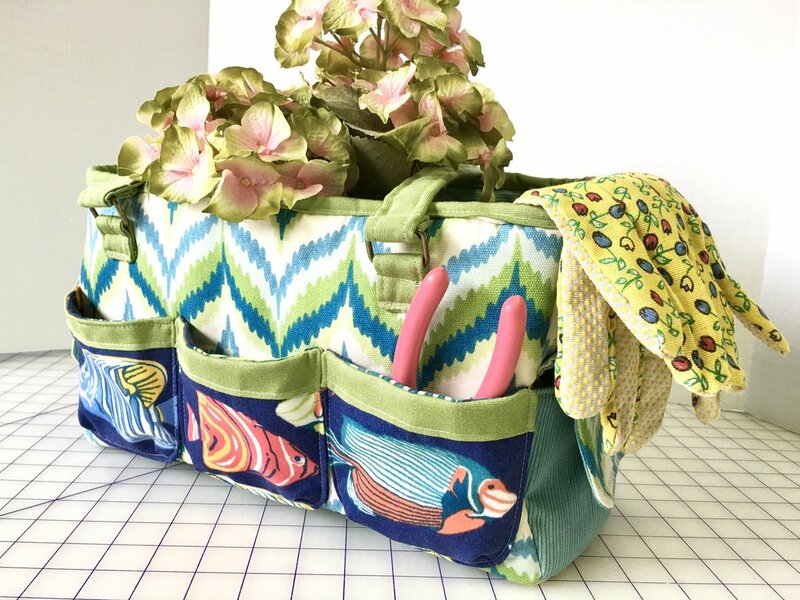 This Oslo Craft bag is meant to be a “Craft” bag, made with quilting cotton fabrics, however, I immediately knew I wanted to make this bag into a garden bag. A garden bag totes hand tools, gloves, twine and other gardening notions. A garden bag is also exposed to soil and water, which means quilting cotton is not going to work. You can use canvas duck, laminated fabric, vinyl etc. I chose to use outdoor fabric, which is essentially woven out of plastic, is mildew resistant and can be rinsed out with a garden hose if need be. you can only use a very low heat iron - or it will melt! No matter what fabric you make this bag from, there are lots and lot of pieces, which means a lot of prep work cutting out all the pieces! Being organized is a must on this project. Label each piece/group of pieces with post-its or paper clipped onto pieces. 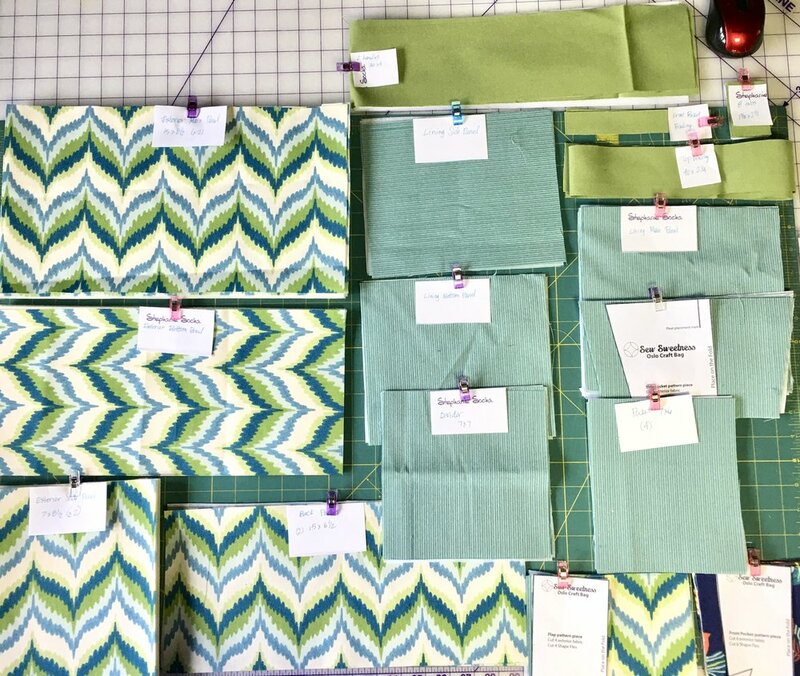 Being this organized makes the sewing of the project fun and fast. Pockets: The front pockets took a little more time as I fussy cut the fish fabric for each pocket, but attaching the pockets was pretty straightforward, provided you draw the guidelines to line them up. Side pockets were supposed to have snap enclosures, but the outdoor fabric was too thick, so I opted to sew in velcro and it worked like a charm! Hardware: I used metal rectangles to connect the handle straps to the bag. 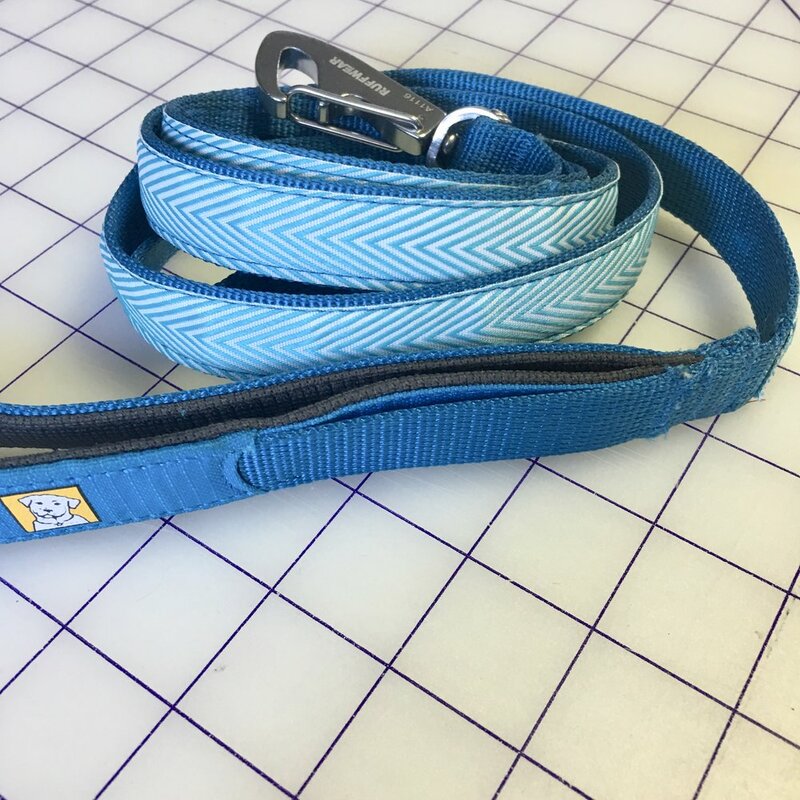 Very easy to sew the straps to the rectangles, just be sure to keep checking that the straps do not get twisted before they are sewn onto the rectangles. You can also sew the straps directly onto the bag, but I like the flexibility that the metal rectangles give the handles. The bag finishes up with contrast binding around the top of the bag, which connects the lining to the exterior of the bag. It's a little weird to sew binding onto a 3D object, but it works out fine - just a little wrestling the bag to turn corners. Here are a few more pics of my finished garden tote masterpiece!! whew!! Lots of pieces, lots of steps, but it all falls into place one step at a time. One other thing to note: typical Sew Sweetness bag patterns usually use lots of stabilizers and foam. Yes, sometimes, I groan and whine when having to cut out and fuse the stabilizer and cut and baste the foam onto exterior pieces, but I also know these stabilizers and foam are what really makes these bags stand out as exceptional pieces of work! Also, there is a great video workshop/tutorial Sara includes with the pattern. I found the video very helpful, evading potential meltdown moments for sure! I love how this bag turned out, and I cannot utter enough praises about Sew Sweetness patterns. They are not an affiliate, and I get zero/nada/zilcho by promoting this company. However, I am passionate about supporting small businesses, and I have had so much positive interactions with Sara and her team. I think she is very generous with her free patterns and tutorials, and it makes me want to support her even more by purchasing her popular "pattern bundles" every time she releases new ones. Check out Sew Sweetness and let me know what bags you have made from her patterns! Lining and exterior ready to become one! New Blog: Make and Decorate! Hello! I am Stephanie Socha, and I want to welcome you to my Make and Decorate blog. This post marks a new beginning for my blog and website. Over the past 10 years I have reconnected with sewing, learned how to piece and quilt, along with other sewing techniques and genres. I am a designer and a maker. I love to make beautiful things for my home, decorating for the seasons and hoIidays, and do a bit of gardening and cooking yummy food. All of which I will post and share with you along the way. Over the years I have made wonderful friends in our maker community, and I feel a passion to contribute to and continue to foster our community of like minded creative souls! I never feel more alive than when in the company of zany, kind and inspirational makers. I hope you enjoy the content and get inspired to make something every day, whether it is a quick pillow, or a long term quilt project or a yummy bowl of soup! In addition to this blog, I plan to launch my very own Podcast, called “Make and Decorate”! I’ve got a few episodes already recorded, so stay tuned for that to finally release into the “wild”…or iTunes. I am so excited about this quilt along! I like that I can choose my own fabric and color palette, and I really like that this is not a "mystery quilt along". I have only participated in one other QAL, and it was mystery and I didn't choose my own fabrics....needless to say - it is still a WIP (work in progress). If you would like more information on this quilt along here is the link to Freshly Pieced, http://freshly-pieced-quilt-patterns.myshopify.com/collections/digital-download-patterns/products/summer-sampler-2016?variant=18157621953 where you can learn more about it and sign up! I am going to try to do either You Tube videos and/or regular Periscopes on my progress of this QAL this summer. If you are interested in following me along, here is my Periscope handle: @stephaniesochadesign. I'm looking forward to this summer project! I''m not sure if I'll make it into a quilt or a few pillows, placemats etc. Stay tuned for updates! Cocktail napkins are somewhat a luxury linen item that most of us do not typically splurge on, but we all love them because they seem so fancy and cute! These cocktail napkins can also be used as hot or cold drink coasters and finger napkins for hors d'oeuvres, and they are easy to make. I love the chunky texture of the hand embroidery, and it really does not take very long to embroider...you can do this part watching tv or at your kid's hockey game. 1. Fabric: I used 100% decorator linen from Fabricut, which is a to the design trade home decorator fabric source. However.... Hawthorne Threads carries a beautiful selection of Kaufman Essex Linen, a linen/cotton blend. This Cotton & Steel fabric would be great to fussy cut a different flower/pattern for each napkin if you wanted to forego the hand embroidery Mochi Floral. 2. Size: standard custom cocktail napkins are between 5" - 6.5" square. I cut my fabric at 7" squares to end up with a finished size of 5.75" with 3/8" seam allowance. Note: you can do a 1/4" seam allowance, but I like the added structure 3/8" gives the perimeter of the napkin without too much bulk. Make two squares... a front and a back of the napkin. Rotary cut 7" squares, or if you are luck enough to have a big accuquilt or sixxiz, then die cut away! 3. I like to draw my own monogram letters, but you can also print one out to the desired size from your computer. 5. Transfer monogram to center of napkin with an iron. I turned the steam off for this part. Also hold the press for a good long moment before lifting. The transfer will be darker with a longer press time. Iron on tear away stabilizer is AWESOME! Again, free marketing for Sulky. 6. Prep for hand embroidery. Stabilizer is a must for hand embroidery, plus it makes the embroidery easier to stitch. You can use regular tear away stabilizer in your hoop. I used Sulky's iron on tear away stabilizer just behind the monogram. 7. Embroider the monogram. Place your stabilized fabric into an embroidery hoop. Use 6 strand embroidery floss for the split stich. Here is a great tutorial from Sublime Stiching on the split stitch. Tear off the stabilizer after you finish the split stitch embroidery, careful to not pull or stretch the stitching. 8. Sew the napkins! Place the front and back of the napkin right sides together. Stitch a 3/8" seam around the napkin, LEAVE a 2.5" opening for turning. Clip corners. 9. Turn napkins right side out, Press. Note: press the opening seam allowances inside as if they were sewn all around. 10. Topstich around perimeter of napkin. This will close up the opening and finish the napkin all in one! Note: you can hand slip stitch the opening closed if you prefer, prior to top stitching.